What does the dark mean to you? Is it a place to turn off the noise of life’s demands? Is it a lonely or sad place? Or scary? Or beautiful? Does the darkness hold possibility? Or emptiness? I ask these questions, not because I think any of us has one single answer; I know I feel all these things and more about the dark. I ask because this month our souls would be well served by paying more attention to our relationship with darkness. The dark is vital. Globally speaking, there is as much night as there is day at any moment in time. The Moon’s cycle contains as much dark as it does reflected light. Shadows live hand in hand with light, yet it is so easy to gloss over experiences of darkness. We’ve got countless ways to push the dark away—the literal dark and the dark times in our lives. All that effort must be telling us something about ourselves. Possibly, the source of our culture’s near constant stress and unhappiness stems from how fast we try to run away from darkness. What if we embraced the darkness? What if we stopped filling the emptiness of the dark with more things to do? What if we stopped running to catch up with the light? I invite you to join me in welcoming the wisdom of the dark. This week the Scorpio lunar cycle begins. This sign mirrors the season of October when we notice the darkness more easily and touch the veils that separate the worlds of the living and the dead. Awareness of these worlds has been deepening since Mercury stationed retrograde in Scorpio on October 21. This particular Mercury retrograde is significant because it conjoins Saturn three times. A year ago, Saturn entered Scorpio. Since then, Saturn has given us the task of soul development. Mercury is reminding us that this work isn’t over yet. With Mercury’s help, we are compelled to turn toward the solemn experience of Saturn’s transit of Scorpio. Another ally supports this work. This week, Mars in Virgo forms an aspect with Saturn that reinforces these experiences. In the dark and in our depths, regeneration waits for the right moment to arise. Perhaps our work is to learn to trust that process. 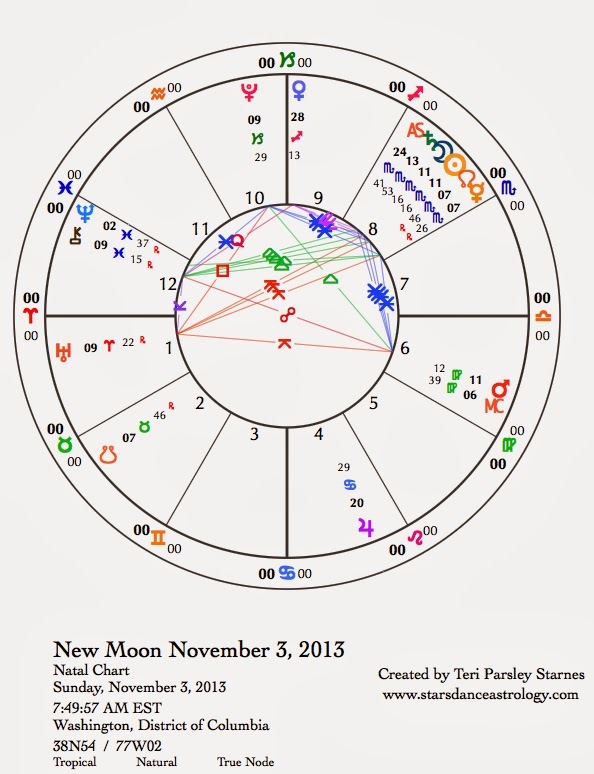 November 3—New Moon: Dreaming. The Scorpio lunar cycle starts with a Solar Eclipse. The lunar cycle begins with a perfect opening to notice the gift and challenge of darkness as we experience a temporary loss of light. Even though it may not be visible where we live, the darkening of the Sun’s face acts like a resetting of the systems we are used to. Dark gives us a gift by taking away what the light has been hiding. Ordinary states are suspended. Sometimes it takes a while to regroup after a solar eclipse event in our lives. Other times, the unexpected change in welcomed. Because we don’t fully know what to expect, we enter a liminal place, a pause between realities, which becomes a potent moment to initiate our lunar intention to develop deeper relationship with the dark. Now isn’t the time to know your answer to the question: What does the dark mean to you? But there are hints in the New Moon chart, whispers from the planetary guides. Mars in Virgo is supporting the work with a goal of creating wholeness and healing. Some of the shadows within the shadows may be the feeling that we must be perfect in order to attain wholeness. What does the dark want to say to you about this? Neptune is stationary (turns direct next week), making it a strong influence. In Pisces, Neptune is supporting the Scorpio planets, asking us to suspend ordinary reality in order to expand our connection with others. In the dark, the dream states of Neptune take us on deep journeys. Honor the visions and feelings by grounding them with acts of service and devotion. The square between Uranus and Pluto, which was exact on November 1, sends strong pulses through our world. Change is a constant. Can we learn to be the midwives to the change that can heal our world? Will the dark teach you how? Jupiter in Cancer is stationary too (turns retrograde this week). This planet has brought the breath of belief to our hearts and hearths since entering Cancer in June. Now this expansive energy pauses to retrace these steps. We have time to reflect on the real value of these things. Jupiter’s initial pass through a sign is the young wine. While moving retrograde, the wine ages and mellows. Our homes are necessary for our developing relationship with the dark time of the year. Venus has reached her greatest elongation as the Evening Star. At 28 degrees Sagittarius, the Queen of Heaven points to the center of our galaxy. The contrast between the sparkling beauty of Venus and the darkness that anchors the galaxy is potent with mystery and meaning. Monday, November 4. Slowly we move from interior places to engage with the outside world. For some, this will be quite a relief! The Moon is officially waxing now, even though the cycle has just begun. We get excited about the next phase of our journeys. Don’t let the excitement lead you away from the welcoming darkness, especially since the Moon squares Neptune opening up the intuitive side of things. Notice the contrasting impulses. Welcome complexity. November 6—Crescent Moon: Beginning. After the Sun sets tonight, look for Venus and the Crescent Moon. These two will be very close to each other in the western sky. Venus greets the young Moon and gives hope to our intentions for this lunar cycle dedicated to the dark. This pairing reflects the archetypal energy of this phase of the Moon—the optimism and confidence that we have at the beginning of a journey. Perhaps you are excited about a new spiritual practice or about what you might reap after doing the work of this cycle. You might receive renewed inspiration or feel emboldened to break free from something in your life that has been holding you back. Let Venus be your initiator. While Venus is in Capricorn we expect to be rewarded for our work and have help in staying committed. The Sun joins Saturn today for their yearly meeting. These two shed light on what we hope to accomplish. Since the work of Saturn in Scorpio involves the soul, we may learn more about what that means to us. The focus today ranges from work to home. Jupiter stations in Cancer, the sign opposite Capricorn. We get a sense that attention to harmony and happiness in the home feeds our greater ambitions and vice versa. Thursday, November 7. The Sun reaches the midpoint of Scorpio today. This is a powerful degree in the Fixed signs and a good day to notice the dark. 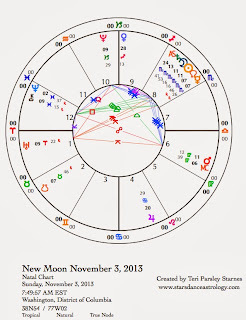 The Moon joins Pluto (co-ruler of Scorpio) and squares Uranus in the early morning (CST). These two planets have been sending the messages that we must change our relationships to the earth and to all beings on the earth. There may be extra stress today, but wisdom flows into the silence and the dark, pay attention. Venus is in a sextile aspect to Neptune. The right relationship is the one that is beautiful. In the darkness, beauty can be surprising. We have the opportunity to let go of superficial beauty to find the beauty that creates sustainability and balance. Friday, November 8. Today the dark holds visions for a new world. Whether we start big or little, we feel inspired. Retrograde Mercury forms a sextile to Venus. In his retrograde persona, Mercury can cause all kinds of communication/technological upsets. This aspect between Venus and Mercury may ease some of those frustrations. We can see the purpose behind some reversals or delays. Does the dark give you more patience or less? One area of potential conflict is where the individual’s need for safety meets the group’s need for taking risks to push our edges out further. Change happens in pulsating waves between these two poles of desire. November 9—First Quarter Moon: Manifesting. This phase of the Moon asks us to look at our dissatisfactions and decide what will we do about them. What are you experiencing this lunar cycle? Are you following the dark into new soul awareness? Or have you deferred that work until your soul has rebelled? This season when death is so close to life, we are reminded to cherish our days and live lives of meaning. Take stock. The planetary allies are supportive. The sextile between Mars and Saturn affirms that we can find the wholeness that creates health and balance. The source of this strength is in the dark. Mercury is stationary (will turn direct tomorrow) and so has stronger influence on our communications and thoughts. Neptune is also stationary and is trine Mercury. Both of these planets are in water signs, emphasizing that our emotions are potent communicators. Notice how words and thoughts impact a larger sphere than we are usually aware of. Waves connect us. From this understanding, how will you manifest your soul’s calling?